The Transfiguration Church, built in 1714 and located with the companion Church of the Intercession on its original site, is for many visitors the defining monument of Kizhi. 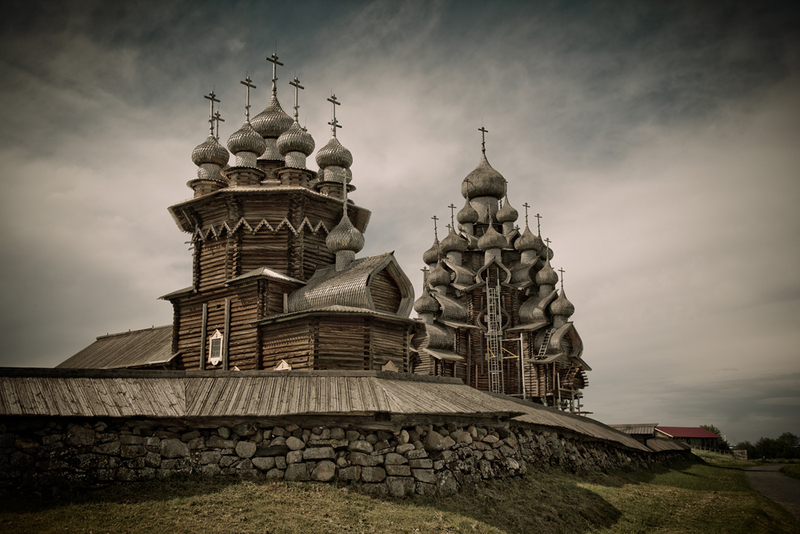 It is imperative to see the Kizhi Island’s spectacular wooden churches. With 22 domes and no nails, Karelia's wooden churches are just amazing. William Clement Smith builder of timber frames and wooden churches are his passion. When he saw a photograph of the wooden churches of Kizhi Island in Mortise & Tenon Magazine, he saved up his money and headed to Karelia with his family to celebrate his 60th birthday and see the spectacular ensemble with his own eyes. He went to Kizhi’s wooden churches, the authentic village of Kinerma, the Belomorkanal and the town of Kem' to uncover the secret of this incredible, airy architecture. Here are seven reasons why more than 180,000 people come every year to see these churches on this tiny island in Karelia and why you should not miss out. 1. The wooden architecture in the churches on Kizhi Island is rated to be world's eighth wonder and is included on the UNESCO World Heritage List. 2. Legend has it that the architectural ensemble on Kizhi Island (in Lake Onega, 764 kilometres north of Moscow) comprising two churches and a bell-tower built in the 18th and 19th centuries, was sculpted by a carpenter named Nestor. According to legend, the only tool Nestor used was his axe. He apparently did not use even a single nail. When the building was completed in 1714 Nestor threw his axe in the lake so that nobody could replicate his masterpiece. However, it must be pointed out that, contrary to legend, there are nails in these wooden buildings, but they were used only to fix the decorative wooden panels to sloping walls and not in the original construction. 3. During World War II, a Finnish pilot refused to obey an order to bomb Kizhi Island. He was in awe of the unusual architecture of the wooden churches and couldn’t bring himself to carry out the mission. 4. The Assumption Cathedral in the Karelian town of Kem' (1105 kilometers from Moscow) is built from logs so thick that no human being could ever wrap their arms around them. 6. The skilled carpentry of the Russian North is a disappearing art, just like Venice. Hurry to see the mastery of these builders before strong northern winds blow these little churches away. 7. While people all over the world are in awe of the construction of Russian northern churches, Smith believes that the main secret to their long-lasting success is quite simple: in contrast to British architecture Russian churches are built with boards that lie horizontally, not vertically. One of the best tour companies for foreign visitors in northern Russia, including Karelia and the Solovetsky Islands, is Nordic Travel. Based in Petrozavodsk and in operation since 2001, the company employs English, German, French, Italian, Swedish and Finnish-speaking tour guides. You can choose from a selection of tours on the company’s website or if you prefer their specialists can develop tailor-made routes based on your wishes. You can reach Petrozavodsk, the capital of Karelia, by train from Moscow or St. Petersburg, or plane from Moscow St. Petersburg, Kaliningrad or Sochi. The planes on this route fill up quickly, so it’s best to book your flight in advance. Trip fares from Moscow start at 5,945 rubles (about $91). For cheap flights around Russia we recommend using jetradar.com, a travel search engine.